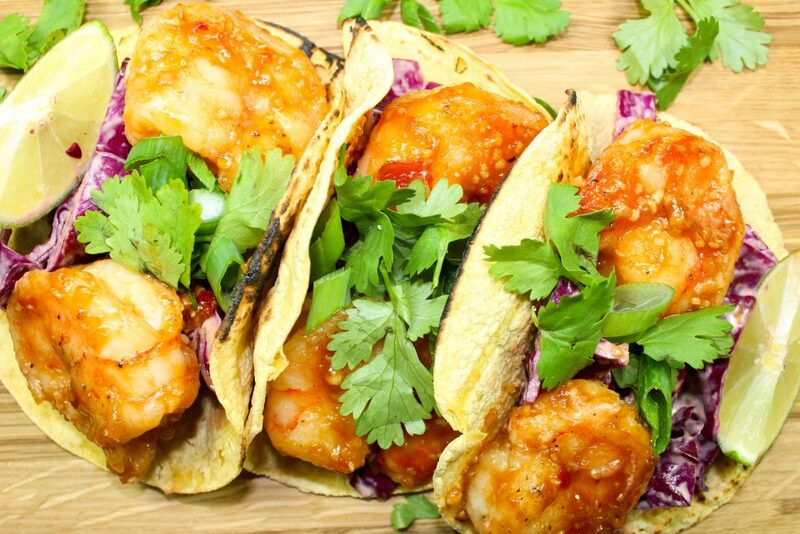 Sweet & Spicy Asian Shrimp Tacos are sweet chili sauce toss in shrimp, in a tortilla & topped with slaw. 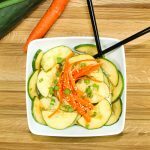 Packed with Asian flavor & Weight Watcher friendly recipe- 6 SmartPoints! Have I told you lately how much I love tacos?? I think about tacos quite a bit… like when can I eat tacos, when can I make tacos, and how can I put a unique spin on tacos. Another thing I really love is Asian food. I feel like I’ve told you that pretty recently. Well, my internet friends, I have the perfect marriage of two of my favorite things- tacos and Asian food. My Sweet & Spicy Asian Shrimp Tacos are dynamite and packed with amazing Asian flavors. Sweet chili sauce with just a hint of spice tossed in perfectly cooked shrimp, wrapped in a tortilla and topped with tangy slaw. Delicious and low fat! This is a Weight Watchers friendly meal and 2 tacos are 6 SmartPoints! I try to eat tacos at least once a week… for breakfast, lunch or dinner. My husband and I moved to Indianapolis a few months ago from the taco capitol of the world- Texas. Austin to be exact. There was a place to get tacos on every corner. Gourmet tacos or street food style tacos. Tacos for days y’all! Our favorite place was a local Austin gem that served the best and most unique tacos. And the best queso you’ll ever eat. Guaranteed. We went to this taco place probably once every two weeks to get tacos, queso, and margaritas. Nothing better in my opinion. This taco place holds a near and dear place in our hearts and to this day we think fondly of all the memories we shared at this taco place. I’m always brainstorming for creative new and healthy combinations of tacos. I love making tacos just as much as I love eating them! A few months ago I was craving Asian food, but tacos at the same time. A problem that I have frequently. While thinking fondly of that beloved taco place, I remember one of their tacos they had on the menu: classic shrimp taco. Since I was craving Asian food I decided to get a little creative and make something a bit different than Mexican style shrimp tacos. I had some frozen large shrimp on hand and cabbage that needed to get used so I came up with these Sweet & Spicy Asian Shrimp Tacos. The shrimp takes little to no time to cook, which is why shrimp tacos are perfect when you are in a crunch to make dinner. If you can get fresh shrimp, that’s always best, but where I live it’s hard to find fresh shrimp. I actually like frozen shrimp that way I can eat shrimp whenever I want! Once the shrimp has been washed and patted dry, add the shrimp to a large zip lock bag and coat with cornstarch. The cornstarch adds a nice little coating on the shrimp. Cook the shrimp in a large skillet for about 5 minutes on each side… super quick! After the shrimp has cooked, add the sweet chili sauce. The sauce it easy to make as well. Just mix jarred Asian sweet chili sauce, rice vinegar, soy sauce, and Sriracha. Mix the ingredients together then after the shrimp are cooked add the sauce to the shrimp, mix well so the shrimp are coated, and let it cook for a few minutes. Oh man… this sauce is SO GOOD. It’s dynamite. While the shrimp and sauce are cooking, I like to heat up corn tortillas on the stove. If you have a gas stove, turn the heat on to low and place the tortilla on the burner. Heat on each side for about 2 minutes. Be careful! If you do not have a gas stove, just up the tortillas in a skillet for a few minutes. This recipe also calls for a quick slaw. I just mixed fat free Greek yogurt, Sriracha, Asian Sweet Chili Sauce, and lime juice and add to shredded red cabbage. 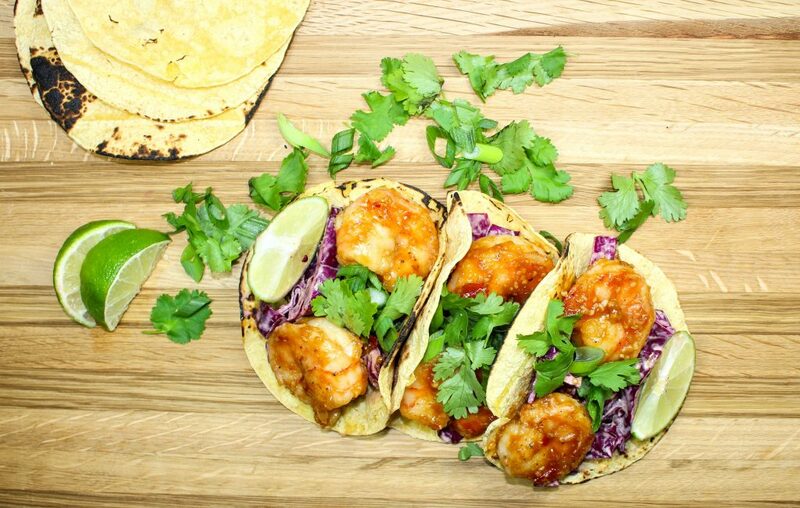 Sweet & Spicy Asian Shrimp Tacos are perfect for a quick weeknight meal. Sweet chili sauce toss in perfectly cooked shrimp, wrapped in a tortilla and topped with cabbage. Asian flavors turned into tacos are sure to please a crowd. Sweet with just a hint of spice. I like to top my tacos with cilantro and a squeeze of fresh lime. Weight Watchers friendly and 6 SmartPoints for two tacos! I hope you enjoy these *taco* bites of flavor! Rinse off shrimp and pat dry. Season with salt & pepper and add to a large zip lock bag. To the bag, add cornstarch and shake the bag to coat the shrimp. Set aside. Cook shrimp on each side for about 3 minutes. 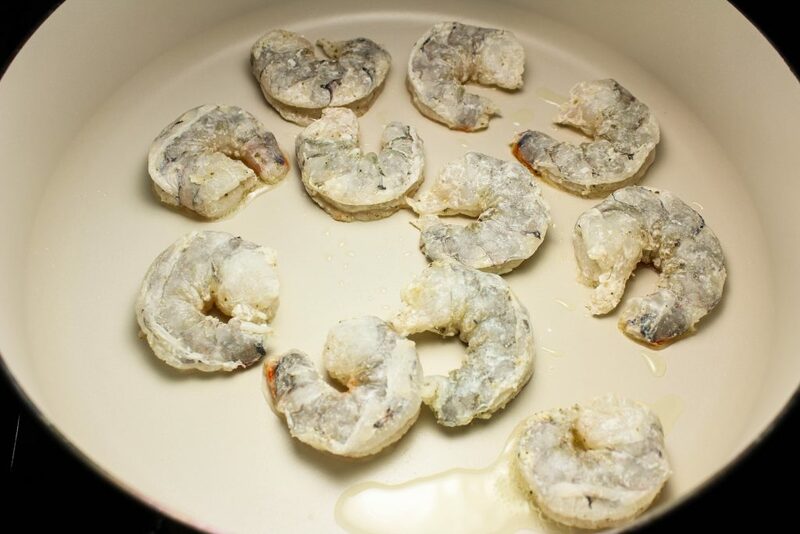 Remove shrimp from skillet and set on a plate. Mix chili sauce, vinegar, soy sauce, and Sriracha in a bowl and combine well. To the skillet over medium low heat, add olive oi. Pour in chili sauce mix and bring to a boil. Add shrimp back to skillet and stir to coat shrimp with the sauce. Add juice of half a lime. Let cook for 5 minutes. Slice cabbage and jalapeno into strips and add to a big zip lock bag. To the zip lock bag, add Greek yogurt, sweet chili sauce, and lime juice. Shake bag to coat cabbage and jalapenos. Heat tortillas over burner to char for 2 minutes on each side. Lay tortilla flat, add some of the slaw and 1-2 pieces of shrimp. Garnish with cilantro and lime wedge. November 1, 2016 at 4:12 pm Very well put together! This is definitely a site that I will always come back to. I love that you've displayed the nutritional facts and provided the info in such an organized format. November 1, 2016 at 5:41 pm Oh thank you! I'm excited for you to get the weekly newsletter filled with my recipes. I hope you try some out soon. Thank you so much for commenting and subscribing Oyinkan! November 1, 2016 at 5:40 pm Shrimp tacos are fairly new for me too and I'm also a spice fiend! Thank you so much for commenting and for the pin :)!! November 1, 2016 at 4:33 pm I love shrimp and I am literally drooling. Great share! November 1, 2016 at 5:39 pm Haha, I'm drooling too just remembering how good they were to eat :). Thanks so much for commenting Kushi! November 1, 2016 at 5:39 pm Shrimp is perfect for quick meals!! I hope you try it soon. Thanks so much for commenting Karyl! November 1, 2016 at 5:33 pm We certainly don't do shrimp enough because I love it! Saving this recipe for next time we need to do a fun Taco Tuesday. November 1, 2016 at 5:38 pm I love shrimp too and sometimes forget how versatile it can be :)! I hope you try this soon. Thanks so much for commenting Chelsea! November 1, 2016 at 5:33 pm We eat tacos once a week too, but the "boring" kind. You just gave me a reason to change them up! November 1, 2016 at 5:37 pm Yes! Tacos are fun to eat :) I hope you try this recipe soon. Thanks so much for commenting Joleene! November 1, 2016 at 5:58 pm YES! This is one of those things I always order at the restaurant but despite my best efforts I can never successfully recreate it at home. Thank you! November 1, 2016 at 6:27 pm I am not crazy about shrimp but will certainly try this using chicken. November 2, 2016 at 10:19 am Chicken would be GREAT for this recipe! To make it even quicker, buy a store bought cooked rotisserie chicken. YUM! Thanks so much for commenting Sharmin! November 2, 2016 at 10:07 am Thank you so much Mila for the comment AND the pin :)! 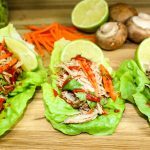 November 1, 2016 at 9:18 pm I've never thought or even heard of Asian tacos, what a yummy idea! That shrimp look delicious! November 2, 2016 at 10:06 am I hadn't heard of these types of tacos until a few years ago. Different, but delicious! Thank you so much for commenting Bree! November 1, 2016 at 10:35 pm I love tacos and these look amazing, Thank you for the recipe it seems like something I can do ! 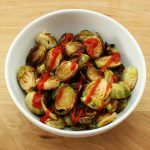 November 2, 2016 at 10:04 am This recipe is easy to make, I promise!! Thank you so much for commenting Breyona! 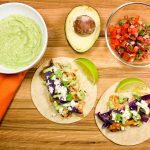 November 1, 2016 at 11:45 pm These tacos look delicious! They definitely would be a step up from regular tacos. November 2, 2016 at 10:04 am Yes, something different than traditional is always fun! Thank you so much for commenting 1stopmom! November 2, 2016 at 8:11 am Love tacos ! This sounds really delicious ! November 2, 2016 at 10:03 am Tacos are the best!! Thank you so much for commenting Idriss! November 2, 2016 at 10:03 am I love chili sauce too!! Thank you so much for commenting Beth! November 2, 2016 at 2:28 pm Great recepie ! And your pictures are lovely! Really making me go to the kitchen and start cooking ? November 2, 2016 at 3:55 pm Thank you so much Ada! The pictures do not lie... these tacos are delicious! November 3, 2016 at 10:14 am They are so good!! I hope you make them soon. Thanks so much for commenting Nicole! November 3, 2016 at 10:14 am Yes! I love that sauce so much :)!! Thanks so much for commenting Jen! November 3, 2016 at 2:51 am Yum! These shrimp tacos look amazing. Since I'm a huge fan of any kind of taco, I will definitely be making these for dinner very soon. Thanks for sharing! November 3, 2016 at 10:14 am I hope you do! I love tacos :)! Thanks so much for commenting Cait! July 16, 2017 at 10:15 pm Do you have the nutritional facts per taco? July 17, 2017 at 9:17 am Great question Kelly! At the bottom of the recipe, there is a nutrition facts for 2 tacos. Here is the breakdown for 1 taco: Calories- 126, Fat- 3, Saturated Fat- 0.4, Carbs- 14, Fiber- 1.9, Sugars- 3.8, Protein- 10. Nutrition is calculated using the Weight Watchers Nutrition Calculator. July 17, 2017 at 12:22 pm What about sodium?